Francesco Borromini, also Francesco Castelli (September 25, 1599 – August 3, 1667) was a prominent and revolutionary Neapolitan and Sicilian Baroque architect in Rome. His major works included the baldachin of St. Peter’s Basilica, the reconstruction of San Carlino, expansion of Sant’Agnes, the design of Sant' Ivo alla Sapienza, and the oratory of Saint Phillip Neri. Borromini originally worked with such architects as Carlo Maderno and Gian Lorenzo Bernini, but Borromini’s first independent design, San Carlino, displays a style unique to Borromini himself. Borromini revolutionized architecture by his treatment of light and space as architectonic components. Borromini’s works often include bold, geometric designs, such as the six-pointed star-shaped floor of the Sant’ Ivo all Sapienza. Borromini’s work caused an uproar among his contemporaries, and influenced design in Europe for the next century. As Neoclassicism gained prominence, he was despised and disregarded, but during the twentieth century his genius has again been recognized. Three centuries after his death, Borromini was featured on the one hundred Swiss Franc banknote. Francesco Borromini was born to Giovanni Domenico Castelli and Anastasia Garovo. Following his father’s footsteps, Borromini was sent to Milan to study and practice stone masonry. After several years of training, he collected a debt owed to his father and, without informing his parents, fled to Rome and changed his name from Castelli to Borromini. He soon began working for a distant relative named Carlo Maderno at St. Peter's. 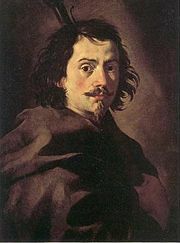 After Maderno’s death in 1629, Borromini began working closely with famous painter and sculptor Gian Lorenzo Bernini. Together they successfully completed the facade and expansions of Maderno's Palazzo Barberini and built the enormous bronze baldachin at St. Peter’s Basilica. In 1632, on the commendation of Bernini and Cardinal Francesco Barberini, Borromini was awarded the office of university architect and began to seek patronage as an independent architect. Borromini established contacts with the eminent Spada family and was also sponsored by Pope Innocent X for a decade, but his relations with patrons were frequently stormy because of his intransigent, defiant attitude. Borromini's first major independent commission was the reconstruction of the interior spaces of the church and adjacent buildings of San Carlo alle Quattro Fontane (also called San Carlino) (1634-37). San Carlino was dedicated to San Carlo Borromeo, and today is considered an iconic masterpiece of Roman Baroque architecture. In designing the church, Borromini avoided linear classicism and eschewed a simple circular shape in favor of a corrugated oval. Siegfried Giedion pointed out in Space, Time and Architecture (1941 etc. ), that Borromini "designed the walls to weave in and out as if they were formed not of stone but of pliant substance set in motion by an energetic space, carrying with them the deep entablatures, the cornices, moldings and pediments" (Trachtenberg & Hyman). Compared to Bernini’s Sant'Andrea al Quirinale, which lies just down the street, San Carlino is far bolder in geometric intricacy and less encrusted with figurative decorations. San Carlino is defined by the undulating elements in the façade (1662-67; illustration, right), united by a serpentine cornice, and sculpted with niches. The flexing boldness of Borromini’s San Carlino bore fruit in the distinctive Neapolitan and Sicilian Baroque. Another notable piece of architecture designed by Borromini was the Sant’Agnese in Agone, Rome. For Sant'Agnese in Agone, Borromini reverted the original plans of Girolamo Rainaldi (and his son Carlo Rainaldi), which previously had its main entrance on Via di Santa Maria dell'Anima, and expanded the façade to include parts of the bordering Palazzo Pamphilj. By doing so, Borromini was able to obtain space for the two bell towers (each of which has a clock, one for Roman time and the other for European time). Before completing Sant’Agnese, Borromini lost his commission due to the death of the Pope Innocent X (1655). The new Pope, Alexander VII, and Prince Camillo Pamphili, then recalled Italian architect Girolamo Rainaldi to complete the project, although the Sant’Agnese would predominately display Borromini's concepts. Sant'Ivo alla Sapienza, courtyard and façade. 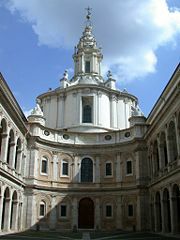 From 1640-1650, Borromini worked on the design of the church of Sant'Ivo alla Sapienza. Built at the end of Giacomo della Porta's long courtyard, the Sant’ Ivo alla Sapienza’s dome and cochlear steeple are peculiar, and reflect the idiosyncratic architectural motifs that distinguish Borromini from other contemporaries. Inside, the nave has an unusual centralized plan. It is circled by alternating concave and convex-ending cornices, and leads to a dome decorated with linear arrays of stars and putti. The church’s floor is a symmetric, six-pointed star. From the center of the floor, the cornice looks like two equilateral triangles forming a hexagon; three of the points are clover-like, while the other three are concavely clipped. Collectively, the innermost columns of the Sant’ Ivo alla Sapienza form points on a circle. The varying architectural features of the Sant’ Ivo alla Sapienza fuse together feverish and dynamic baroque excesses with rationalistic geometric styles. 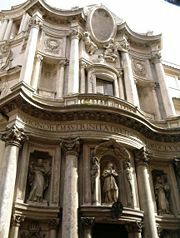 After winning a contest against such renowned architects as Paolo Maruscelli, Borromini was employed to design the oratory and library of the church of Saint Phillip Neri, located in the center of Rome. Although the congregation of Saint Phillip Neri already had one of the most well-decorated Baroque churches in Rome, they planned to build an oratory, as well as residential quarters, adjacent to the church of Santa Maria in Vallicella (Chiesa Nuova). Borromini worked on his design for thirteen years, and by 1640, the oratory was in use. Three years later, the library was complete. The oratory of Saint Phillip Neri was characterized by a striking facade adjacent to the church entrance, articulate half columns, and a complex rhythm of pilasters. Borromini was a contemporary with the prolific papal architect, and, late in life, a rival of, the eminently successful Gian Lorenzo Bernini. Borromini is purported to have been a strong influence on the Piedmontese architect, Camillo-Guarino Guarini and his successors. In the early 1660s, Borromini suffered several setbacks. Sant’Agnese, an important commission, had been taken away from him and completed by someone else. His patron, Padre Virgilio Spada, and his only disciple, Francesco Righi, both died. Work on another project, S. Andrea delle Fratte, came to a halt, and he was obliged to add lateral extensions to the facade of St. Philip Neri, which disfigured his original design. Beset by severe melancholia, he traveled to Lombardy, but suffered a relapse when he returned to Rome. He burned all of his drawings and never left his house for weeks at a time. In the summer of 1667, he became ill, and his mental condition worsened. After he suffered seizures, it was decided that he should be forced to abstain from all activity in order to rest. One hot night, frustrated and unable to sleep, he rose in fit of anger, found a sword and fell on it. Before dying, he repented, received the last sacraments of the church, and wrote his will. His death directly followed the completion of the Falconieri chapel (the main chapel) in San Giovanni dei Fiorentini, where he was buried. Francesco Borromini was featured on the one hundred Swiss Franc banknote current in the 1980s. From the beginning, Borromini's works created an uproar in Rome, and his influence pervaded design in northern Italy and in central Europe for a century or more. As Neoclassicism grew popular, his work was increasingly despised. Disregarded for much of the nineteenth century, Borromini's architecture has again been appreciated in the twentieth century as the creation of genius. Borromini revolutionized architecture by his treatment of light and space as architectonic components. He challenged the restrictive, enclosing qualities of wall by using perforations and by substituting pillars, colonnades or other structures to define interior spaces. In his first independent commission, the small Roman church and monastery of S. Carlo alle Quattro Fontane, he stacked together three distinct units that normally would have been used only in separate buildings: a curious, undulating lower zone; a middle one suggesting the standard Greek-cross plan; and an oval dome, a relatively new and still little-used form, which appeared to float because its supports and light sources were hidden by the lower sections. His early training as a stonecutter in Lombardy profoundly affected his architectural designs. There he acquired the technical skills to overcome a number of structural difficulties; he often worked with the stonecutters on site to help them achieve his designs. Architects of his time tended to base their designs on an anthropomorphic concept, emulating the structure and proportions of the human body; Borromini's approach was to establish a geometric figure for a building or room, then articulate this figure by means of geometric subunits. The fundamental standards for architecture in the sixteenth and seventeenth centuries were derived from interpretations of ancient Greek and Roman structures. Borromini was an avid student of classical architecture, but rather than adopting orthodox motifs, he drew from Roman structural achievements and from unusual interpretations and adaptations found in Roman buildings. He believed in progressing beyond the achievements of antiquity, citing Michelangelo’s statement that he who follows others never goes ahead. ↑ Borromini's suicide, taken from Anthony Blunt, Borromini, pp. 208-209. Retrieved February 13, 2008. Portoghesi, Paolo. 1968. The Rome of Borromini; architecture as language. New York: G. Braziller. Marvin Trachtenberg and Isabelle Hyman. Architecture: from Prehistory to Post-Modernism, p. 346-7. This page was last modified on 21 April 2017, at 14:35.